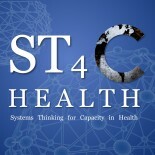 The Introduction white paper (An Introduction to Complex Systems Thinking in Health) introduces key systems thinking concepts that can be applied to health systems at every level. These key concepts include mental models and diverse perspectives, interrelationships, boundaries, shared visions, unintended consequences, emergence, feedback loops, adaptability, leverage and transformational leadership. This entry was posted on March 24, 2016 by chads in White Papers.